Are you planning to travel to Phuket this summer? Have you been reading all these blog posts about places to visit in Phuket ? or did you read too many blog posts that you got confused? Who doesn’t love watching the sun goes down especially when the view is breathtaking. You might have heard about Promthep Cape and its beautiful view of the sunset, but what you or your tour guide might not know is the small temple located near Pomthep Cape itself, the Sum Nuk Song temple. It is about 300 meters from Cape’s main carpark and it offers you the same gorgeous view of the sunset without the crowds. A beautiful beach, if it’s too crowded won’t look as beautiful anymore. If you want to get away from the crowd and truly enjoy your time on the beach, Freedom beach is the place to go. It is known as one of Phuket’s quietest beaches due to its exclusive and difficult to access. The beach itself is covered by beautiful white sand and surrounded by hills covered in thick jungle. Enjoy the relaxing environment lounging on a chair under the shade of a palm tree, sipping on fresh coconut water without the crowds and any worry. If you want to enjoy the beautiful view of nature and the genuine Thai food, you should consider going to Kin Dee. Kin Dee is a small family restaurant at Mai Khao located at Hin Look Diew estuary. This place comes highly recommended, not only for its food but also for its idyllic setting, unpretentious attitude and ‘undiscovered’ feel to it. It has fabulous views out over the adjacent mangrove swamp and estuary with light natural breezes. Kin Dee serves fresh, clean local seafood, meat, and vegetables. It also offers a variety ranges of beverages from local beer, cocktails, and wines. You also don’t have to worry about the service, as Kin Dee’ s staff members are friendly and speak English just fine. There are several viewpoints in Phuket such as the famous Kata Viewpoint, Windmill Hill, and Promthep Cape. However, if you are looking for a peaceful viewpoint that offers a beautiful panorama you should go to Radar Hills viewpoint. This is a military base viewpoint and people tend to still believe you just can’t go up there as soldiers will ask you to leave, hence it’s not crowded. 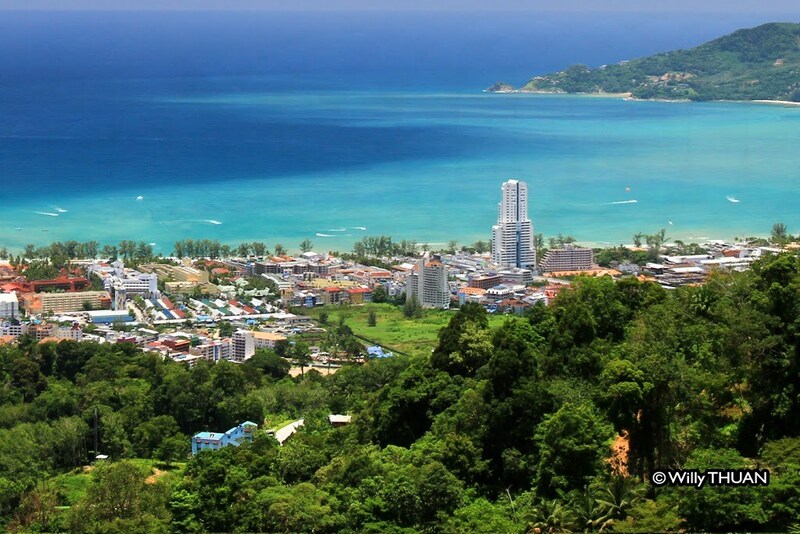 The small street leading to the top is hard to find, but once you have found it and climb to the top you will discover the most amazing panorama of Patong Beach. Enjoying some snacks and beer in a bar, paired with a beautiful view? count me in! This bar is located off Hasip Pee Road in Patong Beach and it offers you an amazing view of the whole bay of Patong on Phuket’s west coast. The price of the food and drink are reasonable and you will get the chance to enjoy great sunset in Phuket. Furthermore, the place is far from the crowd, so why not give it a try? I hope these tips help you to decide which places you want to visit in Phuket. Don't forget to follow our Facebook, Twitter, and Instagram for more updates!